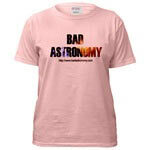 Bad Astronomy: "That's as remote as the dark side of the Moon!" Good astronomy: "That's as remote as the far side of the Moon!" I had the misfortune this morning to wake to the radio playing the song "Dream Weaver" (I used to love that song when I was a kid, but as a friend of mine likes to say, "We are not responsible for songs we liked when we were 15 years old"). As the tired, hackneyed refrains went on, one in particular caught my ear: " Fly me away to the bright side of the moon, and meet me on the other side." Of course, there is a bright side of the Moon, and you can go to it. But if you sit still, you can only be there for two weeks. The bright side (and therefore the dark side too) is not a fixed place, but appears to move as the Moon revolves around the Earth. Seen from the surface of the Earth, the Moon does not appear to rotate. This is because from an outside frame of reference, the Moon rotates once for every time it goes around the Earth. So from our vantage point, the Moon is naturally divided into two halves: the hemisphere we always see, called the nearside, and the hemisphere we do not see, the farside. The farside has only been seen by probes or astronauts that have actually orbited (or at least passed by) the Moon. This is very different from the dark side. As the Moon orbits the Earth, different parts of it get illuminated by the Sun. When the Moon is between the Earth and the Sun, we see it almost entirely in shadow. This is called the new moon. Half a lunar orbit later (two weeks or so) it is fully illuminated by the Sun, giving us a full moon. In between we get a half moon, sometimes confusingly called a quarter moon because the Moon has completed 1/4 of an orbit. These are called the phases of the Moon (I have heard that some people think that the phases are caused by the shadow of the Earth on the Moon; but that is whole different can of Bad Astronomy). So imagine you are standing on a spot directly in the middle of the nearside. You would see the Earth straight over your head. If it were new moon to someone on Earth, the Sun would be behind the bulk of the Moon to you. For you, it would be local midnight! Two weeks later it would be full moon to someone on Earth, and it would be local noon to you; the Sun would be high overhead. The half moon to someone on Earth means it would be either sunrise or sunset to you, depending on whether you are a week past new moon or a week past full moon, respectively. You can see that the dark side of the Moon is just simply the night side of the Moon. It is no more a fixed feature than the night side of the Earth. The Pink Floyd album may be one of the best selling albums of all time, but astronomically it's in eclipse. Bad Addendum: At the end of the album "Dark Side of the Moon" by Pink Floyd, there is a voiceover that actually says "There is no dark side of the moon. As a matter of fact, it's all dark. The only thing that makes it look alight is the sun." In a sense, that line is correct: the Moon is actually very dark: it only reflects on average about 10% of the light that hits it (the specific reflectivity changes depending on the lunar surface; some parts are very dark, while others can be pretty bright). As a comparison, slate reflects about 10% of sunlight that hits it. The reason the Moon looks so bright is is that it is sitting in full sunlight, and so there is a lot of light hitting it. Special thanks to Bad Readers Josh Millard and Keith Collyer for the Pink Floyd lyrics correction, and to Bart Schaefer for the Dream Weaver correction (he was 15 once too)!